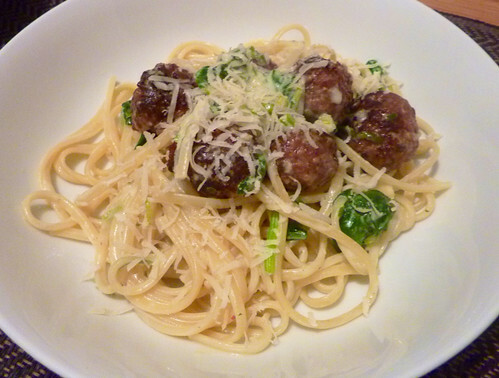 At a recent farmers market I had purchased a pack of ginger & spring onion meatballs from Lochbyre Rare Breed Meats. My plan was to serve the meatballs with pasta although I wasn't sure whether to serve with a cream or tomato based sauce. In the end, I decided that a tomato based sauce would be too overpowering for the delicate flavours in the pork meatballs. Heat a little oil in a pan, brown the meatballs before removing and placing in an ovenproof dish. Put the meatballs in a preheated oven 180C for fifteen minutes. Heat a little more oil in the pan and add the garlic, ginger & spring onion. Fry for a few minutes before adding the soured cream and soft cheese. Stir the contents of the pan together, you can add a little milk to loosen the mixture. Cook the pasta and drain, retaining a little of the cooking liquor in the saucepan. 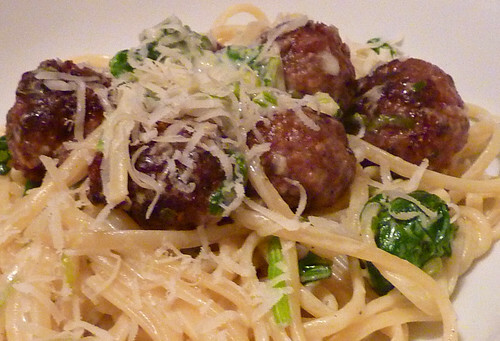 Pour the creamy sauce over the pasta, stir in the spinach leaves and meatballs. The heat from the pasta will help the spinach wilt and cook through. To serve, divide the creamy past between two bowls before covering with a generous amount of freshly grated Parmigiano Reggiano. This dish took just twenty minutes to prepare, give it a try and let me know how you get on.